The Lightning port is a relic of the past, and it belongs with SCSI ports and buggy whips. On Tuesday, Apple is almost certainly going to unveil the first iPad with a USB-C port. This could easily mark the beginning of the end for the Lightning connector across all iOS devices. USB is a welcome addition to the iPad, but Apple should take a more radical step for the iPhone line. Instead of exchanging the Lightning connector for another data/power port, maybe these handsets shouldn’t have one at all. There’s ample evidence that the 2018 iPad Pro models will have a USB-C port. This change is overdue. These professional-grade computers are used like laptops and shouldn’t be hampered by the limitations of the Lightning connector that debuted in 2012. It’s already possible to connect an external monitor, Ethernet, and some other accessories to an iPad, but these require special adapters. Tablet users need access to a wide range of peripherals without needing special-purpose equipment to make the connection. Bluetooth can do some of what’s needed, but not everything. We already know that the iPad’s USB-C port will support external monitors. Hopefully, Apple realizes that iPad owners need to go beyond that and have access to a broad range of USB-C accessories, including hard drives and mice. An iPad Pro is a MacBook alternative, and Apple markets it that way. One of few remaining limitations in current models will be removed if USB-C replaces Lightning, but only if Apple fully embraces the new port. While an iPhone has as much computing power as an iPad, handsets are used in completely different ways. Adding accessories to an iPhone doesn’t happen as often, which is why Apple should seriously consider getting rid of a port for them. 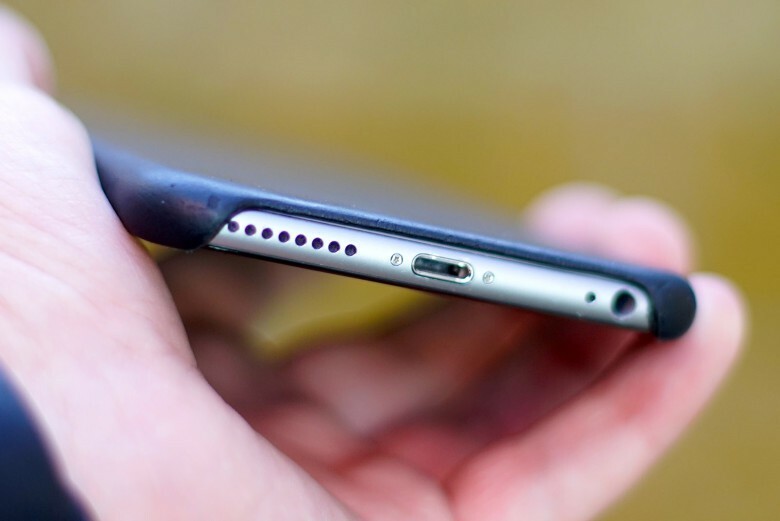 Not just replacing Lightning with USB-C, but actually not having a charging/data port at all. The Lightning port is almost exclusively used for charging the device. But recent iPhones already have an alternative method: wireless charging. If there was no longer a Lighting port, a wireless charger would have to be bundled with every iPhone, but that hardly an insurmountable issue: it already happens with the Apple Watch. This legacy data port is still used to synchronize with iTunes and do backups, but these can be done over a Wi-Fi connection. Or these tasks can be done with iCloud — we own both an iPhone and an iPad that have never connected to iTunes and probably never will. There’s really no need for a Lightning port left. That leaves it as a waste of space in a device in which space is at a premium. There are other advantages, too. iPhone unlockers hack in through the Lightning port. If there wasn’t one, they’ve be stymied. And this port must be a challenge to making iPhones truly waterproof. Admittedly, it’s a radical move. Apple could just switch both iPhone and iPad from Lightning to USB-C, as the EU wants it to. But there are real benefits to making the change. Benefits that could outweigh some momentary inconvenience for some users. True, wired charging can be faster. But that doesn’t seem like enough to hold back a move that will bring so many positive changes. Especially considering most iPhone owners use the charger that came with their device that’s no faster than wirelsss charging. Apple has made similar moves in the past. It’s stopped putting a headset jack in iPhone models because there were wireless options. And there’s no charging/data port in the Apple Watch and it doesn’t suffer from the lack. The future of the iPhone is all wireless, and the Lighting port is holding it back.